I’ve spoken before about my picky eater… and was essentially harrassed about my parenting skills. But whatever… that’s not going to stop me from writing about him again. For those of you who commiserated with me, here is a little trick that typically works for us. I like to call it Personification of Food. In this particular case… Octodogs. 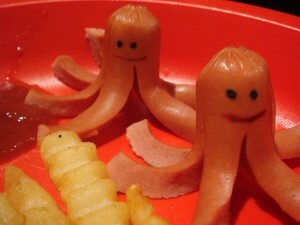 Hotdogs cut to look like octopi. I actually even found a little gadget online that allows me to do this quickly (sold on some bento-supply site). I cut the dogs in half, create the legs and toss them into boiling water. Within a matter of minutes the legs begin to curl up… bringing to life the Octodog. A little food coloring for the eyes and mouth and viola! Though, sometimes the 4-yo only wants to eat the legs… stating that he won’t eat the faces. Solution? Candy sprinkels for eyes… there’s no way they can resist. Last night, I sliced the a hotdog into coins and then used a very small star-shaped cutter to the cut each disk into a star. The 4-yo gobbled them up telling me that “star-shaped hot dogs taste much better than regular one”. And what about the scraps? He ate those as well… surprisingly. Personification of food is done quite often when creating bento boxes. It’s cute, fun and seems to work.